(Nanowerk News) Rainer Blatt‘s and Piet Schmidt’s research team from the University of Innsbruck have successfully realized a single-atom laser, which shows the properties of a classical laser as well as quantum mechanical properties of the atom-photon interaction. The scientists have published their findings in the journal Nature Physics ("Quantum to classical transition in a single-ion laser"). The first laser was developed 50 years ago. Today we cannot imagine life without the artificially produced light waves - lasers have become an integral part of many appliances used in telecommunication, household, medicine, and research. A laser normally consists of a gain medium, which is electrically or optically pumped, inside a highly reflective optical cavity (or resonator). The light in the cavity bounces back and forth in the form of modes whereby it is amplified repeatedly. One of the distinctive features of a classical laser is the steep increase of output power when a certain pumping threshold is reached. At this point the gain (amplification by the medium) equals the losses as the light circulates through the cavity. This is caused by the amplification of the interaction between light and atoms: The more photons are present in a mode the stronger the amplification of the light in the mode. This stimulated emission is usually observed in macroscopic lasers comprising of many atoms and photons. A high-finesse optical cavity consists of two mirrors, which traps and accumulates the photons emitted by the ion into a mode. The ion is excited cyclically by an external laser and at each cycle a photon is added to the cavity mode, which amplifies the light. The Innsbruck researchers have demonstrated that a laser threshold can be achieved at the smallest possible building block of a laser: a single atom, which interacts with a single mode in an optical cavity. A single calcium ion is confined in an ion trap and excited by external lasers. A high-finesse optical cavity consists of two mirrors, which traps and accumulates the photons emitted by the ion into a mode. The ion is excited cyclically by an external laser and at each cycle a photon is added to the cavity mode, which amplifies the light. For strong atom-cavity coupling the regime of atom and cavity shows quantum mechanical behavior: Only single photons can be introduced into the cavity. “As a consequence, stimulated emission and threshold are absent,“ explains François Dubin, a French postdoc and first author of the publication. 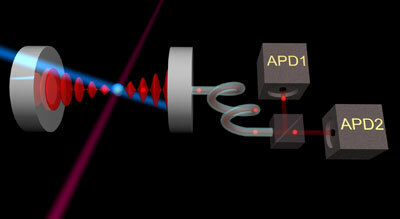 A ‘quantum laser’ was demonstrated in a similar regime some years ago. What is new in the experiment of the Innsbruck researchers is the ability to tune the coupling of the atom to the cavity mode. By choosing the right parameter of the drive laser, the physicists were able to achieve stronger excitation and, consequently, add more photons to the cavity. Although there was still less than one photon in the cavity, the researchers observed stimulated emission in the form of a threshold. “A single atom is a very weak amplifier. As a consequence, the threshold is much less pronounced than in classical lasers,“ explains Piet Schmidt. An even stronger excitation does not result in a higher output, which is the case in a conventional laser, but in the quenching of the output due to quantum mechanical interference. This constitutes an intrinsic limitation of miniature single-atom lasers. Therefore, researchers from the University of Innsbruck want to further investigate the transition between quantum and classical lasers through the controlled addition of more and more ions interacting with the light field.